Marion County (standard abbreviation: MN) is a county located in the U.S. state of Kansas. As of the 2010 census, the county population was 12,660. The county seat is Marion. The county was named in honor of Francis Marion, a Brigadier General of the American Revolutionary War, known as the "Swamp Fox". For millennia, the land that is currently Kansas was inhabited by Native Americans. In 1803, most of modern Kansas was secured by the United States as part of the Louisiana Purchase. In 1806, Zebulon Pike led the Pike expedition westward from St Louis, Missouri, of which part of their journey followed the Cottonwood River through Marion County near the current towns of Florence, Marion, Durham. In 1855, Marion County was founded. The city of Marion Centre was founded in 1860, became the county seat, and later the city name was shortened to Marion. The first settlers in Marion County located on Doyle Creek, near the present site of Florence. They were Moses Shane, who came in 1858, and whose death the next year was the first in the county; Patrick Doyle, in 1859, for whom Doyle Creek and Township were named, and a family by the name of Welsh, in which occurred the first birth in the county in August 1859. In the spring of 1859, a trading post was established at the "Lost Spring" on the Santa Fe Trail, and in the autumn of the same year, the Moore brothers established a ranch near the present site of Durham, and the first post office was established at this place. Later in the same year, a post office was established at "Lost Spring" near the current city of Lost Springs. Previous to this the nearest post office was Emporia. The next year Billings, Griffith, Shreve located where the city of Marion now stands. The population of the county in that year was 74. Originally, Marion County covered more than a third of the area of Kansas, including all the territory in the state south and west of the present northern and eastern lines of the county. The original location of the county was fixed by legislative act in 1860. It comprised less than the present area. The original boundaries were altered by an increase of territory on the west and a decrease on the south. In 1863, the legislature by special act fixed the boundaries to include all of southwestern Kansas. In June of that year, on petition of the citizens of the county, the governor restored the previous boundaries and ordered a separate organization of the county. The south-eastern border one mile "notch" with Chase County was established under unusual circumstances. A murder had occurred and Marion County didn't want to have the trial, so a section one mile wide and eighteen miles long was ceded to Chase County to ensure the murder had occurred there. The one mile strip of land remains in Chase County to this day. 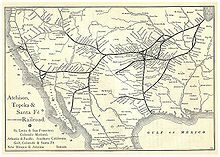 The state of Kansas granted the Atchison and Topeka Railroad three million acres (12,000 km²) of land if it would build a continuous line to the western border of the state within ten years (March 1, 1873). In 1871, the railroad pushed westward from Emporia through Florence, Horners, and Peabody towards Newton, and got title to the land in 1873. According to the original land grant, the railroad was to receive every odd numbered section for ten miles (16 km) on each side of its track, but in eastern Kansas which was pretty well settled, much of this land wasn't available. The law therefore gave the railroad what was called "in lieu" lands further west. Eventually this worked out to be half the land on a strip twenty miles (32 km) on each side of its track from Emporia nearly out to Kinsley, which meant that most of Marion County fell in this strip. In 1887, Atchison, Topeka and Santa Fe Railway built a branch line from Neva (3 miles west of Strong City) to Superior, Nebraska. This branch line connected Strong City, Neva, Rockland, Diamond Springs, Burdick, Lost Springs, Jacobs, Hope, Navarre, Enterprise, Abilene, Talmage, Manchester, Longford, Oak Hill, Miltonvale, Aurora, Huscher, Concordia, Kackley, Courtland, Webber, Superior. At some point, the line from Neva to Lost Springs was pulled but the right of way has not been abandoned. This branch line was originally called "Strong City and Superior line" but later the name was shortened to the "Strong City line". The railway is connected via a switch to allow north-bound "Rock Island" traffic to connect onto the north-west-bound "Santa Fe" tracks. This is the only way for the Santa Fe traffic to travel north-west after removing the tracks to Neva. As early as 1875, city leaders of Marion held a meeting to consider a branch railroad from Florence. In 1878, Atchison, Topeka and Santa Fe Railway and parties from Marion County and McPherson County chartered the Marion and McPherson Railway Company. In 1879, a branch line was built from Florence to McPherson, in 1880 it was extended to Lyons, in 1881 it was extended to Ellinwood. The line was leased and operated by the Atchison, Topeka and Santa Fe Railway. The line from Florence to Marion, was abandoned in 1968. In 1992, the line from Marion to McPherson was sold to Central Kansas Railway. In 1993, after heavy flood damage, the line from Marion to McPherson was abandoned. The original branch line connected Florence, Oursler, Marion, Canada, Hillsboro, Lehigh, Canton, Galva, McPherson, Conway, Windom, Little River, Mitchell, Lyons, Chase, Ellinwood. In 1996, the Atchison, Topeka and Santa Fe Railway merged with Burlington Northern Railroad and renamed to the current BNSF Railway. Most locals still refer to this railroad as the "Santa Fe". In 1887, the Chicago, Kansas and Nebraska Railway extended its main line from Herington to Pratt. This main line connected Herington, Ramona, Tampa, Durham, Waldeck, Canton, Galva, McPherson, Groveland, Inman, Medora, Hutchinson, Whiteside, Partridge, Arlington, Langdon, Turon, Preston, Natrona, Pratt. In 1888, this main line was extended to Liberal. Later, this line was extended to Tucumcari, New Mexico and El Paso, Texas. This line is called the "Golden State Limited". In 1887, the Chicago, Kansas and Nebraska Railway built a branch line north-south from Herington to Caldwell. This branch line connected Herington, Lost Springs, Lincolnville, Antelope, Marion, Aulne, Peabody, Elbing, Whitewater, Furley, Kechi, Wichita, Peck, Corbin, Wellington, Caldwell. By 1893, this branch line was incrementally built to Fort Worth, Texas. This line is called the "OKT". The "Rock Island" has switches in Peabody and Lost Springs to allow connections to the crossing "Santa Fe" railroad in each city. The Chicago, Kansas and Nebraska Railway was foreclosed in 1891 and was taken over by Chicago, Rock Island and Pacific Railway, which shut down in 1980 and reorganized as Oklahoma, Kansas and Texas Railroad, merged in 1988 with Missouri Pacific Railroad, and finally merged in 1997 with Union Pacific Railroad. Most locals still refer to this railroad as the "Rock Island". In 1889, the Marion Belt and Chingawasa Springs Railroad built a 4.5 mile railroad from Marion north-east to Chingawasa Springs. A hotel was built near the site of the spa at Chingawasa Springs, and a depot and eatery as well. Both Santa Fe and Rock Island offered round trip fares from Chicago and western cities to Chingawasa Springs. An economic panic in 1893 closed down the health spa and hotel, and quarry business along the tracks never developed sufficiently. In 1893, the railroad ceased operations, and tracks were removed in 1910. Truck hauling 36-Inch pipe to build Keystone-Cushing Pipeline (Phase II) south-east of Peabody at corner of Timber Rd and 20th St. (Whitewater Center Church in background), in 2010. From 1935 to 1937, the Marion County Park and Lake was constructed southeast of Marion. From 1964 to 1968, the Marion Reservoir was constructed northwest of Marion. In 2010, the Keystone-Cushing Pipeline (Phase II) was constructed north to south through Marion County with much controversy over road damage, tax exemption, and environmental concerns (if a leak ever occurs). According to the 2000 census, the county has a total area of 953.54 square miles (2,469.7 km2), of which 943.11 square miles (2,442.6 km2) (or 98.91%) is land and 10.43 square miles (27.0 km2) (or 1.09%) is water. Marion County is located in the Great Plains, and the eastern part of the county is part of the Flint Hills. As of the census of 2000, there were 13,361 people, 5,114 households, and 3,687 families residing in the county. The population density was 14 people per square mile (5/km²). There were 5,882 housing units at an average density of 6 per square mile (2/km²). The racial makeup of the county was 97.06% White, 0.47% Black or African American, 0.59% Native American, 0.19% Asian, 0.01% Pacific Islander, 0.55% from other races, and 1.14% from two or more races. 1.92% of the population were Hispanic or Latino of any race. There were 5,114 households out of which 30.50% had children under the age of 18 living with them, 63.80% were married couples living together, 5.50% had a female householder with no husband present, and 27.90% were non-families. 25.20% of all households were made up of individuals and 14.20% had someone living alone who was 65 years of age or older. The average household size was 2.46 and the average family size was 2.94. In the county the population was spread out with 24.80% under the age of 18, 7.90% from 18 to 24, 23.50% from 25 to 44, 22.70% from 45 to 64, and 21.10% who were 65 years of age or older. The median age was 41 years. For every 100 females there were 95.10 males. For every 100 females age 18 and over, there were 92.20 males. The median income for a household in the county was $34,500, and the median income for a family was $41,386. Males had a median income of $30,236 versus $21,119 for females. The per capita income for the county was $16,100. About 4.80% of families and 8.30% of the population were below the poverty line, including 9.50% of those under age 18 and 9.70% of those age 65 or over. Marion County contained some oil boom towns and cattle loading pens at railroads that have since been abandoned. Watchorn, oil town, 5 miles east of Peabody. Marion County is divided into twenty-four townships. The cities of Florence, Hillsboro, and Marion are considered governmentally independent and are excluded from the census figures for the townships. In the following table, the population center is the largest city (or cities) included in that township's population total, if it is of a significant size. 1845 Santa Fe Trail map. 1860 Santa Fe Trail map. 1891 Atchison, Topeka & Santa Fe Railway route map from Grain Dealers and Shippers Gazetteer. 2010 map of Marion County with Township Boundaries. ^ "2010 County Population and Housing Occupancy Status". U.S. Census Bureau. http://factfinder2.census.gov/faces/tableservices/jsf/pages/productview.xhtml?pid=DEC_10_PL_GCTPL2.ST05&prodType=table. Retrieved March 28, 2011. ^ 1806 Pike Expedition map through Marion County. ^ a b Marion County Kansas : Past and Present; Sondra Van Meter; MB Publishing House; LCCN 72-92041; 344 pages; 1972. ^ County and Keystone settle on road damages; Hillsboro Free Press; November 2, 2010. ^ Keystone Pipeline - County ask TransCanada for pipeline emergency plan; Hillsboro Free Press; February 15, 2011. Marion County Kansas : Past and Present; Sondra Van Meter; MB Publishing House in Hillsboro, KS; LCCN 72-92041; 344 pages; 1972. The Early Schools of Marion County Kansas; Wilma Stewart Stallwitz; Located at Peabody Township Library; 33 pages; November 11, 1960. This page uses content from the English language Wikipedia. The original content was at Marion County, Kansas. The list of authors can be seen in the page history. As with this Familypedia wiki, the content of Wikipedia is available under the Creative Commons License.